The Braves put up between $230 million and $280 million in cash (no explanation of why this may vary), plus pledge to pay the county $6.1 million a year from rent, naming rights revenue, parking revenue, and ad board revenue, enough to pay off another $92 million in construction bonds. Total team contribution: between $322 million and $372 million. Cobb County puts up $24 million in cash, plus another $17.9 million cobbled together mostly from existing property tax revenues and new property and hotel tax surcharges in the stadium district, enough to pay off another $276 million in construction bonds. Total taxpayer contribution: $300 million. This, obviously, would be somewhat better than the original $450 million public/$200 million private split that was first reported on Monday. It’s still a hefty chunk of change, though — $300 million doesn’t grow on trees, as Cobb County schoolteachers can tell you — and even going halfsies on a project where 100% of the revenues (after paying off the stadium) are going to the private tenant isn’t much to write home about. Is this everything? The document says the $672 million price tag covers “stadium, parking and related infrastructure,” but it’s unclear whether that includes, say, the massive highway upgrades that are going to be necessary to get 40,000 Braves fans on and off the adjacent interstate highways. The Braves owners have promised to pay for cost overruns on the stadium, but not on infrastructure. What if the tax receipts fall short? Presumably the projected tax revenues are based on expectations of property values and hotel development in the stadium district. That district, though, is about to be at a severe disadvantage when it comes to attracting (or maintaining) businesses: those newly instituted property and hotel tax surcharges. Normally I’d say that the fear of business being driven out of town by high taxes is overblown — they’re a small share of costs — but when the choice is of opening a hotel in an area where you’ll have to pay an extra $3 per room per night in taxes and opening one literally across the street, there has to be at least some concern that tax revenues will fall short. Right now, we don’t have a clue what the backup revenue source is if this happens, except that it doesn’t appear to be the Braves. What about taxes? This is a huge one: As we’ve seen before, the value of tax breaks can add up quickly. The county summary doesn’t give any indication whether the Braves stadium (or the planned development around it) would pay its usual share of property taxes; if not, then that’s an additional taxpayer-provided gift to the team that it could use to pay off that 55% share. So: The Cobb County stadium plan still looks pretty bad for taxpayers, though not as bad as a couple of days ago, but it still could be just as bad depending on what we haven’t been told so far. The AJC is promising more details “later today”; we’ll see if they answer any of the above questions and help us give this a score on the cromulent-to-craptacular scale. You should love this deal, Neil. It’s not Cobb County residents who will pay for this. It’s the evil corporations. The CID covers areas with hotels, office buildings and chain restaurants. None (or, almost none) of it is residential. Whether taxing commercial landlords is a good idea is a separate question from whether those taxes should be spent on a baseball stadium. Regardless, though, about $130 million of the cost will be paid for out of existing property taxes throughout the county, i.e., by residents. Moreover, it’s not like either landlords or business that own their buildings look at their property tax bills and say, “Well, we’ll just eat that out of our margins.” If you sleep at a hotel or eat at a Chili’s around the stadium, that tax is being passed on to the bed you sleep in or the extreme nachos you are eating. Your right Ben, all the good residents of Cobb will not pay one penny more in property taxes now for their new toy…they’ll just have to look at paying more for their normal services for a) dollars from the treasury diverted to the stadium, and b) look at having them raised later when they realize the revenues they’re on the hook for to pay the Braves didn’t materialze from the Four Seasons building a hotel next to the stadium full of out-of-towners who wanted to cross off a vacation in Cobb County from their bucket list. As usual, there will be much hand-wringing, and some token opposition voiced, but in the end, it will sail through with little to no problem, and once again the public will be stuck with the bill. We do NOT live in a representative democracy…we live in a plutocracy where the wealthy have the access to power/government that allows them to do whatever the hell they want, public sentiment be damned. Ben, you must not understand the concept of fungibility. It means all of a certain item (like money) are the same as other all items of that sort, so they’re mutually interchangeable. Which means the source isn’t so important since a dollar from one source is the same as a dollar from another. Which means, if these taxes HAPPEN to come from businesses, it doesn’t matter. Because unless Cobb County has tons of extra money, the money coming from businesses that goes toward the stadium instead of say, teachers, will have to be replaced by money from residents to pay those teachers. Or, if you’re for tax cuts, the money coming from businesses to pay for the stadium could be used to pay for something you think residential taxpayers pay for, and then give the residential taxpayers a refund or tax cut. “self-taxing” doesn’t seem like the appropriate term here. I kinda doubt participation is voluntary. If some businesses around the stadium site want to help in building the stadium, fine. But somebody within this CID is going to end up subsidizing a business that they’re competing with for discretionary income, not so fine. This is why I now use airbnb when I travel. While I’m sure eventually the loophole will be closed and person-to-person rentals stopped, it’s nice to be able to visit a town and not be on the hook for their latest stadium upgrades or money losing convention center. The gap between advertised price and what you actually pay for a hotel room keeps getting larger and larger as more cities see visitor taxes as an unlimited source of free money. Of course what always happens in these situation, a alternative market pops up in response. Maybe not on a large enough scale for anyone to care but if you’re sick of the “soak our guests every way possible” mentality, person-to-person rentals will at least give you some personal satisfaction. As far as Cobb County goes, judging from the comments on local blogs/papers by the usual Tea Party crowd, this has been deemed one the “good uses” of taxes. While there will be some token opposition, it’ll easily be approved by the county. It’s also provided cover for the Falcons whose fans are still claiming to have “only” cost the city $200 million. Yeah but if you read the doc the property tax rates are staying the same. That means the only way the numbers work is if residents’ property values increase, thus causing the additional $8.5M/year in property taxes to be collected. Any resident of any county in any country will gladly pay more in property taxes if it means that their residence is worth more. Any resident of any county in any country will gladly pay more in property taxes if it means that their residence is worth more. Every time I see Cobb County without thinking about Ty Cobb….. wrong Cobb namesake. Every time I see Cobb County I keep thinking about Ty Cobb….. wrong Cobb namesake. And I don’t represent anyone. I just dislike BS and a ton of anti-stadium people are fluent in it. I get that all money is fungible. Now, do you get how supply side economics works? It means that wealth gets created from productivity. Or, in this case, it means that if you build a stadium in Cobb County, then property values will rise, thus increasing property tax revenues WITHOUT INCREASING TAX RATES. If you take the advice of the economics experts in this comment thread or throughout much of academia, then you would not build a stadium and there would be no additional property tax revenue to divvy up. Sure, but you know darned well that the $8.5M is based on an expectation of increased property values. They just can’t phrase it that way because it is uncertain. All true. But again: every homeowner in every county every where will take that tradeoff. Note: Offer not valid in any existing reality. Ben: No, I don’t know darned well that. And nobody, including Cobb County officials, Braves execs, or people in the media who support the deal seem to think this is the case. But you go on believing it if you like. “ANLBC” stands for Atlanta National League Baseball Club. • Annual guarantee paid to ANLBC equal to the greater of $10,000,000 annually (increasing by annual CPI) or 25% of all annual gross revenue of the development (including, without limitation, rental, lease, parking, advertising or other revenues). • ANLBC to control and retain rights to sell naming rights and related advertising and sponsorship inventory for the development and to retain all revenues from such sale. • No signage, advertising, branding, retail or other exterior promotional exposure for any competitors of ANLBC exclusive sponsors (See Exhibit A for protected categories which may be amended from time to time by ANLBC). • No fast food restaurants other than one (1) coffee shop (e.g. Dunkin’ Donuts, Starbucks). • No third party retail may sell Braves merchandise or tickets within the development. • Limit to two (2) sports bars and two (2) fine dining restaurants within the development and must be on the northern part of the development a minimum of 1,600 feet from front gates of Turner Field. • No adult entertainment clubs, pawn shops, tattoo parlors, liquor stores, title loan shops, automotive shops or other industrial business or any establishments that may be offensive or vulgar to the community or Braves’ fans. • Development must include deck parking to accommodate 8,600 cars for use during all games by ANLBC. • Development must include additional transit options (maglev, light rail, bus, trolley, etc.) and ingress and egress improvements. Turner Field Operating Agreement Renewal Requirements — an outline of what the team wanted in capital improvement funds and confirmation of the team’s desire to end its relationship with the AFCRA. • ANLBC to fund $50M of improvements, AFCRA to fund $50M and City/County to fund other $50M over the 3-year period (2016 – 2018). • Capital Improvements going forward after 2018 to be funded 50/50 by ANLBC and AFCRA/City/County until such time as development is generating annual minimums set forth above ($10,000,000) after which time ANLBC will assume 100% of Capital Improvement funding obligation. • AFCRA oversight to end in 2014 (including relinquishment of Turner Field office space) and ANLBC to deal directly with City of Atlanta. • ANLBC to assume management and oversight of all parking agreements and special events at Turner Field including GSU and County parking agreements. • ANLBC and AFCRA/City/County will amend and restate current Operating Agreement and extend term for an additional 20 years. I have yet to see anyone involved with the deal even be asked if property tax revenues are expected to rise. If you have a link to a quote about that, please share. Call me crazy, but I think it’s on you to tell us why you believe that when they wrote “existing Property Tax Revenues,” they meant something other than “existing Property Tax Revenues.” And “because Arthur Laffer says so” doesn’t count. And yes, Lee goes on to say he hopes property values and sales tax receipts will go up when the stadium opens. But the $8.5 million a year in property tax money for the stadium will come from the current budget — the county isn’t going to wait around to see if tax receipts go up, and then give those to the Braves. First, if you get that money is fungible, then why say something incredibly stupid like: it’s okay, the money is coming from corporate taxes, so it doesn’t affect residents. That kind of thinking, which is what you basically said, SCREAMS not understanding fungibility. Thank you, I figured it was just a matter of time before you invoked “supply side” economics (lower taxes, less regulation) in defense of subsidies (tax-and-spend, direct government interference with the free market) again. How can we not take your arguments seriously? Sorry Cobb County teachers….you’re screwed again. $8,670,000 in reallocation of existing Property Tax Revenues (no increase in property tax millage rate for Cobb County homeowners). So no increase for tax payers but obviously nearly $9MM less for a school system that is cutting back. I like Ben Miller’s contributions to this blog. In this case, his claim is that this government spending will increase property values in Cobb county. I agree that infrucsture spending can improve an area (and thus it’s property values), but this is inefficient use of funds. Better to improve recreation centers, parks, and ball fields throughout the county. Next up, maintain open space, improve schools (in Colorado at least, almost nothing improves property values as much good schools), staff the police department, and keep taxes reasonable. Of course, this is up to the citizens of Cobb county to decide. 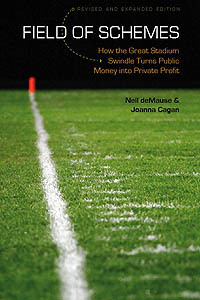 The point that gets missed by Ben, and others, is that the purpose of this blog is counter the misinformation and over simplified analysis about stadium funding that is put out there be the leagues, the sports team owners, and the local and national media (much of which have broadcast contracts with teams and leagues). The blog also helps keep in perspective the huge amount of money that goes into this private industry. For example, here in Colorado, the local newspaper, and all of the local TV stations, and the most popular family of mostly conservative talk radio stations all have contracts with the local sports teams. When, inevitably, the next call for public stadium funds arises (I predict the Broncos, within 5 years, after all their scoreboard is not as big as somebody’s), this site, and Neil specifically, will be a crucial source that citizens and the alternative media will turn need. If I was an existing Cobb county restaurant or retail owner, I’d be wary of this new development (and the competition it presents) and bitter about the extent to which my tax dollars are paying for it. if you don’t like what your elected officials are giving away to sports teams or whatever business interests, vote them out. run against them. taxpayers have power; use it and stop whining. this deal can’t/couldn’t happen if the cobb county commissioners didn’t feel that they could vote for and still keep their offices. That’s a fine idea, and has been tried and sometimes successful elsewhere. (Google “Carlos Alvarez.”) Unfortunately, voting incumbents out of office is very difficult in this country, and has become even more so since the Citizens United ruling. Plus, there’s no guarantee that the new politicians voted into office won’t do the same thing, as has happened in numerous cities. Also, small point, but *voters* have power, *taxpayers* don’t necessarily. In an age of voter ID laws, that’s not a trivial distinction. The”You can just vote people out if you don’t like their decisions so don’t criticize those decisions” line of thinking also implies that politicians who are not running again (as are many who are voting for these boondoggles) are beyond criticism. Which is frankly dumb.